They are twins, goes the opening line of this video, but they don't share a birthday because these are twins born days apart, born 24 days apart to be exact. But then, surely, they're not twins? But, no, it's not that simple, nothing is ever simple. In what must have been a terrifying experience the mother, Linda da Silva, was only 24 weeks pregnant with twins when her waters broke. Four days later one of the twins Alexandre, was born weighing just 1 pound, 10 ounces after a quick delivery, he was so tiny his dad could hold him in one hand. "They brought him to me to give him a kiss," DaSilva told website Boston.com, recalling the whirlwind delivery after just three painless pushes. "He was crying, but he was very tiny and I was very scared. I said to my husband, 'He's too tiny.'" Even though survival chances are 50//50 for a baby born so early, he went into intensive care and, thankfully, survived. Not wanting to risk the other twin's health, the doctors told da Silva that keeping it in the womb for a delayed pregnancy would give it the best chance for survival. "When you have a situation where one baby is born and labor stops, you are given this window of opportunity," one of the doctors said. "But it's a rare window. Most times, labor does not stop." 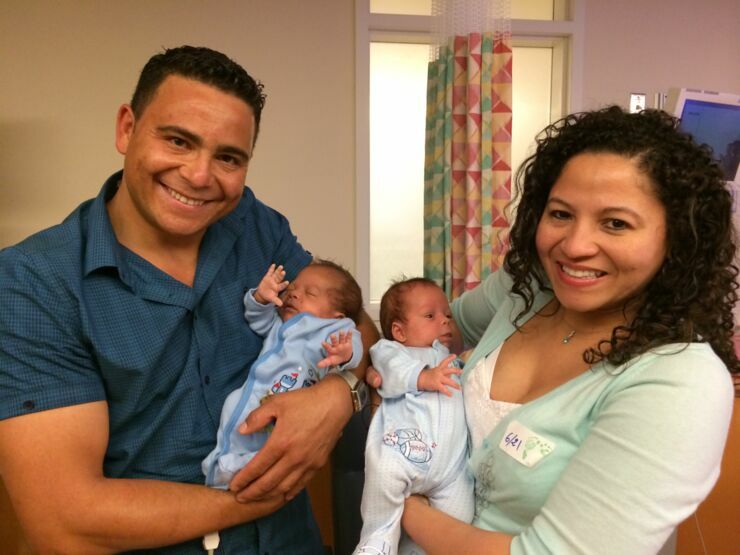 The Miracle Twins (Ronaldo and Alexandre) Born in Boston 24 Days Apart. So they left the little dude there to grow stronger and develop and 24 days later little Ronaldo was born, weighing nearly three times more than his little bro. Now, in what is the happiest of endings for all involved, both twins born 24 days apart, are thriving. 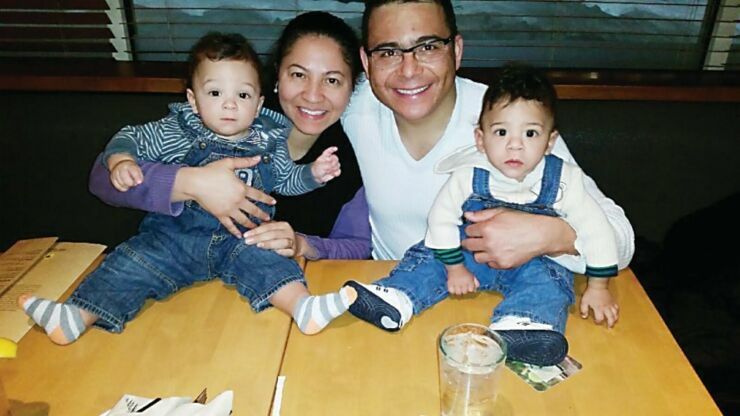 "They're my miracle babies," said DaSilva. "Ronaldo because he stayed inside, and Alexandre because he's a survivor." Mom Lindalva Pinheiro da Silva leaves hospital with her husband Ronaldo Antunes and their two babies. A few days later Lindalva Pinheiro da Silva and Ronaldo Antunes smiled as they left the hospital holding their twin miracle boys, Alexandre and Ronaldo, in their car seats after a long and emotionally exhausting journey that few parents ever have to endure. But these twins who were born 28 days apart are doing great. The da Silva twins, who stayed in the NICU, are now almost the same weight, which is very rare in the case of delayed interval deliveries. "I was in a panic," DaSilva told 'Today', "I thought I was gonna lose the babies." But the story doesn't end there. One year on a party was held at the Tufts Medical Center for Alexandre and Ronaldo Antunes to celebrate the first birthday of twin boys who were born 24 days apart. Many of the the staff who helped their family during their births last March were there to fuss over the twins born 24 days apart and celebrate their special day. The Daily Mail reported "Lindalva Pinheiro da Silva, the boys' mother, held back tears as she thanked the doctors and staff for their work during her pregnancy while at the party on Thursday at Tufts Medical Center." celebration not only marked a milestone but served as yet another show of support from those who helped carry the boys through a remarkable first year. “This is the best part of the job for me,’’ Dr. Jonathan Davis, the hospital’s chief of neonatal medicine said. “It’s why we come to work every day." The miracle twins (Ronaldo and Alexandre), born 24 days apart, with their mom and dad.